Dolphin Leisure only supply the finest quality of Swimming Pool and Spa water treatments. Our own 'Dolphin Leisure' brand of swimming pool chemicals are packed for us in the UK by one of the major suppliers and the products will always reach you in the peak of condition. PLEASE NOTE : We are unable deliver chemicals or any liquid products overseas. All other items can usually be delivered overseas and there may be an extra carriage charge. Whatever water treatment you choose to sanitize your swimming pool or hot tub, it will only be effective with the pH of the water balanced within the range of 7.2 to 7.6 parts per million. Also whatever system you choose will require regular shock dosing (oxidizing), the frequency of which will depend on the bather load. Non chlorine products such as PoolSan or Blue Crystal are safer than traditional Chlorine treatments and easy to use. Hygiene without chlorine usually means no stinging eyes, skin irritation, bad taste or smells. Blue Crystal avoids the necessity for daily checks and dosing. Used with a shock dose treatment the Blue Crystal products provide an excellent alternative to chlorine. 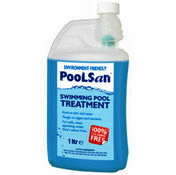 PoolSan - 100% Chlorine Free Swimming Pool and Spa water treatment. PoolSan is a safe effective chlorine replacement that offers bacteriology control in Commercial or Domestic Pools and Hot Tubs. We also recommend Aquafinesse for your Spa or Hot tub. Simply apply the liquid once a week, keep an eye on the small tablet dispenser and that's it. The super soft feel to the water results in a much more pleasant bathing experience. All pool chemicals should be fully dissolved or diluted in water before adding to the pool. 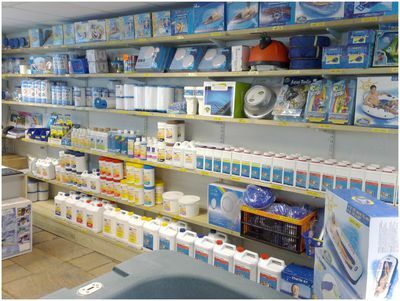 All pool chemicals should be stored in a dry place and out of the reach of children and pets. PoolSan is a SAFE, effective chlorine replacement and it is a completely CHLORINE FREE system that offers efficient bacteriological control in commercial or domestic pools. A once a week check system which saves time and ensures a crystal, clear, safe, healthy, swim for all of the family. No more red or stinging eyes it is ideal if you have any members of your family or friends who have sensitive skin. New an easier way of testing - Test strips for copper levels and test strips for Oxygen levels also the original Test kits are now back in stock. Aquafinesse the gentle giant in water treatment. Special Offer Buy Two for £169.90 for a saving. For perfect spa bathing - apply AquaFinesse just once a week and that's it. No smell, no taste, no testing and super soft feeling water! AquaFinesse is a patented environmentally friendly water care solution that allows users to enjoy their hot tubs without the harsh effects of chemicals. We take the guesswork out of hot tub water care in one easy step per week! You and your family will soak in the most luxurious water without the time and hassle of measuring multiple chemicals. AquaFinesse is so bather friendly that you can dose the spa while you're still in it ! Spa Flush or the new Spa Clean Tablet are a Hot Tub & Whirlpool Pipe Cleaner. You should always use the Spa Clean Tablet if you have been using other products to sanitise your Spa, or, if your Spa has been left empty for a while.